Pilates has interesting origins. It was started during World War 1 by Joseph Pilates who developed floor exercises to help rehabilitate detainees who were suffering from disease and injury. He used springs and hospital beds to create pulley devices for muscle strengthening and rehabilitation. Joseph Pilates went on to open his first Pilates studio in New York in 1926 where, many dancers from the New York Ballet Company attended. Through movement we aim to restore, improve and enhance motor function. Pilates is made up of a combination of relaxation, concentration, alignment of the body, breathing and centering. It encompasses co-ordination, control, flow of movement, stamina and integration of the body. Inner core muscles stabilise our spine segmentally and improve posture and protect internal organs. It is a very useful tool in rehabilitation especially back pain. Pilates integrates physical conditioning with mental awareness. We offer both individual and group Pilates classes for strengthening and flexibility. We recommend individual classes if recovering from an injury or operation. We also offer Pregnancy Pilates run by physiotherapists. These classes are beneficial in preparing for labour and post-natal recovery. They also help to improve posture, decrease strain on muscles, joints and ligaments, thereby reducing pain and discomfort. 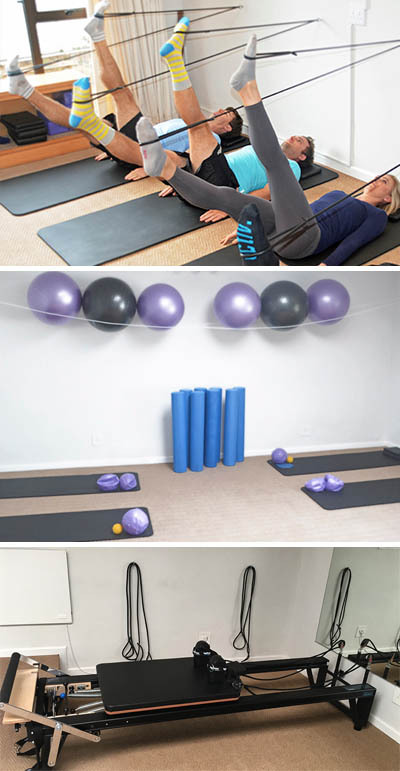 Pilates also helps to strengthen pelvic floor control and assists with relaxation. We offer both mat work group classes and private sessions on the reformer.